YouTubers across the world are slowly disappearing. In vlogs days before their disappearance they appear to be nervous, emotional, saying goodbye to their friends and family as if for the last time and packing all their things like they are running from something. But where do they go you ask? 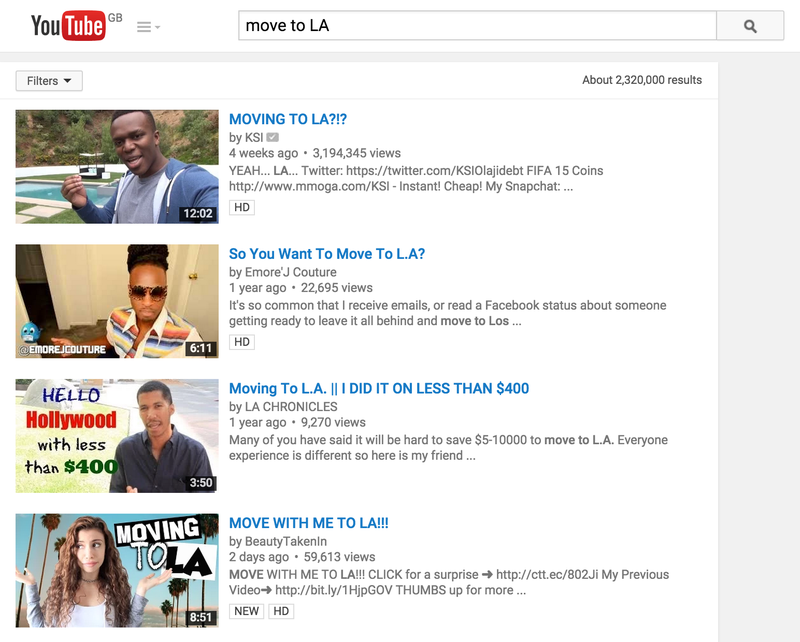 LA, the land of fame and fortune, and, over the past few years, seemingly almost all YouTubers ever. It’s a right of passage nowadays. Once, they receive enough subscribers, or, for some reason (read: stupid), have few but want to gain more, they decide to move to LA. There, collaborations with other YTers are limitless and instantly your “cool” factor goes sky high. No one wants to watch a Day in My life in no-where Mississippi. A DiML in LA, however, is something everyone would pay to see- not that they’d need to pay since so many are posted- and would watch everyday. Most of the community is there, so go to where they can collaborate and gain more subscribers through association-a collab introduces viewers to similar creator, giving them more followers and visa versa. However, while these are true, imo this decision create a standard. I call this the Stepford YouTubers. They all live in LA: “The weather is perfect omg”, they all have the same friend group who ultimately appear in most collab videos without any new content, and they produce videos within the same cookie-cutter format. Vine culture is extremely similar to this, moving to LA because of accessibility, but it’s on a much, much larger scale. Every time I re-download the app and scroll through, the most popular viners feature the same people and over again. And since they’re only 6 seconds long, it’s a lot easier to see the repetition. Additionally, sponsors almost exclusively partner with the same popular viners who fill people’s feeds with the same, unoriginal content. I remember when Uptown Funk came out there had to be at least 20 videos where viners danced/lip synced/acted to the song. I think we need a LA intervention. YouTube needs originality. It needs diversity. People shouldn’t feel pressured to move there just because everyone else is. If you have a substantial amount of subscribers, sure, go ahead (not that you need my permission). LA is not a starting point. It’s a place to grow. Owning a camera is a starting point. Find a style and voice before anything else. Finally, LA is freakishly expensive and in a drought so you better bring two things: a car and rain.